The history of the Soup Club Cookbook is interesting. Four women decided that it would be fun to start a soup club where once a month each one would make a mammoth batch of soup and deliver their soup to the three others. So, once a month, an individual would cook a huge batch of soup and deliver it to the other three families. The other three weeks of the month, that person would get home-made soup delivered to them, since the other three members were assigned to those weeks. The soups would be packed in jars, and any sides and add-ins would be included, like grated cheese, fresh herbs, croutons, or anything else essential to serving the soups. Serving instructions are also included, so everyone knows how it's intended to be served. It sounds like fun, as long as your tastes are similar to those of your friends or you're willing to accommodate. If one cook is a heat freak while others aren't, it would be simple to leave the spice as an add-in instead of having it mixed into the soup. And they note that the receivers can certainly embellish the soups as they please - adding leftover vegetables or bulking up the soups with rice or noodles or croutons. 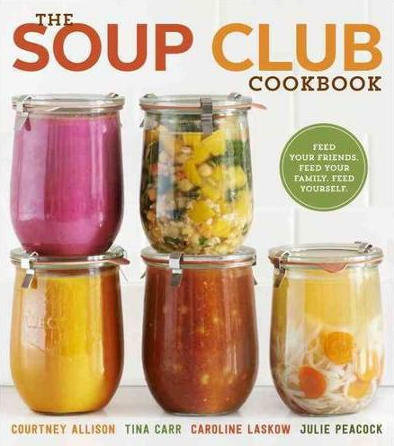 The recipes in the book came from the soup club, and make sufficiently large batches - 8 quarts. So - you have choices. Follow the recipes as-is and share with friends or freeze portions for later. Or, cut the recipes into portions that make sense for your family. Fortunately, soup recipes tend to be forgiving, so if you can't cut an ingredient quantity precisely into thirds or quarters or whatever you need, you can estimate or go by your personal taste, and it will be fine. As far as the recipes, I have to say that I make a lot of soups and I improvise a lot, but there were enough twists and turns and interesting ingredients to intrigue me. And, it's not all soups. There are (of course) recipes for garnishes, but there are also recipes for salads, vegetable side dishes, breads, pastas, appetizers, and even a few entrees. I've got a zucchini lasagna bookmarked for summer when the ingredients are in season, but there's a good chance I'll make it as soon as I see zucchini on sale. I have a number of other recipes that I'll be making sooner. If you're thinking about starting a meal-sharing club or you have a ginormous family or you want to cook in quantity and freeze for later, you'll love this book. If you've got no trouble dividing recipes to make smaller portions, you'll be happy with this book. If you need to follow recipes exactly and you're cooking for two ... well, you'd better like soup an awful lot.